The HP ProBook 5330m is a business notebook, but if you didn’t know that, you might confuse it for a very nice consumer notebook thanks to a number of user-friendly features. Unlike many business notebooks, the HP ProBook 5330m has backlit keys, good Beats Audio and a premium on looks. The HP ProBook 5330m would be an excellent ultraportable laptop if only it had the long battery life to go with its sturdy, attractive design and good specification. As such, it's just a good laptop rather than a superb one. If you can live with its comparatively short battery life or just need a fast processor, it's a good alternative to the MacBook Air. If applications performance is entirely unimportant, the considerably cheaper Sony Vaio Y series has longer battery life making it a great budget alternative. At the end of the work day, the HP ProBook 5330m is the kind of business laptop you'll be happy to take home. For just $799 or $899 you get a well-equipped notebook with extremely durable construction, good performance an a nice keyboard with LED backlighting. 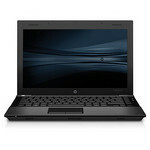 Taken on its own, the HP ProBook 5330m seems like a reasonable laptop. Business travelers will be pleased by the sturdy construction, matte display and excellent performance. At least, that is, until other mile-high executives pass by in the airport with their own choices. Suddenly the flaws in this product start to reveal themselves.